Breakfast and Lunch are provided. 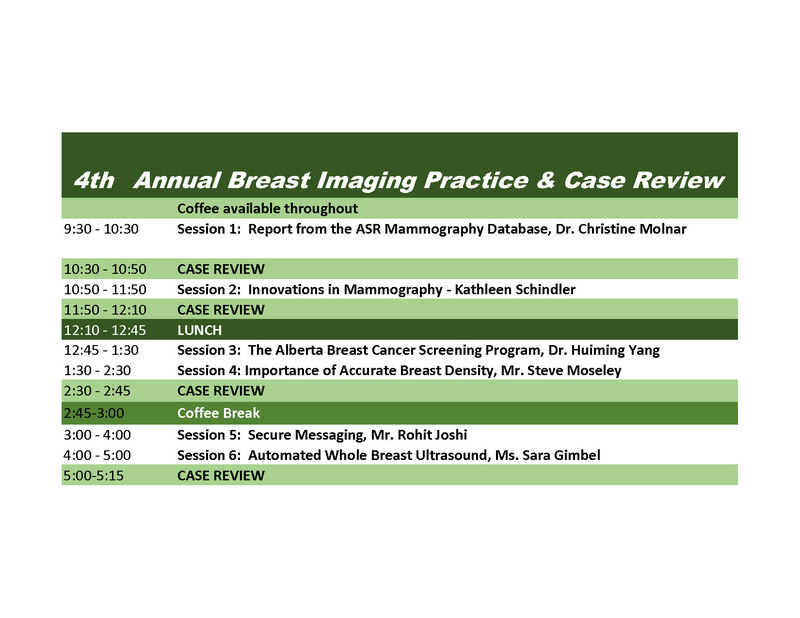 This event is directed to Radiologists, Mammography Technologists and Sonographers who practice and study in Alberta, to provide information directly related to breast cancer screening, breast imaging and breast interventions imaging in order to improve day-to-day professional practice, particularly in the Alberta context of the Alberta Breast Cancer Screening Program. Registration is also open to any General Practitioners, Residents, and healthcare providers wanting to increase their knowledge. By the end of the program, the participants will be able to describe their work within the health care team model for patient centered care. By the end of the program the participants will be able to critique educational questions that explore a variety of medical competencies including patterns of recognition and abnormalities. By the end of this presentation the participants will be able to explain Quality Assurance/Improvements underway at the ASR Database to continue to improve the provincial program. By the end of this presentation the participants will be able to explain the current clinical environment of technologies in a breast department. By the end of this presentation the participants will be able to explain the new advances in applications and their impact on clinical outcomes for a patient and clinician regarding mammography. By the end of this presentation the participants will be able to explain technology design choices and their significance to dose, IQ and workflow as it relates to mammography. By the end of this presentation the participants will be able to advocate for consistent messaging and delivery of breast care in Alberta for the benefit of the patient. By the end of this presentation the participants will be able to explain the clinical implications of the screening approaches and improving care. By the end of this presentation the participants will be able to explain the importance of breast density and its implications in the ability to detect cancers. By the end of this presentation the participants will be able to distinguish the difference in assessing breast density as a 3D phenomenon vs a 2D perception of breast density. By the end of this presentation the participants will be able to explain the importance of positioning and how Quality Control software can improve repeat rates, cancer detection rates, throughput and efficiency. By the end of this presentation the participants will be able to explain the importance communication with patients, colleagues and other facilities and the risks to patient confidentiality that come along with that communication. By the end of this presentation the participants will be able to recognize cases in which ABUS was used.